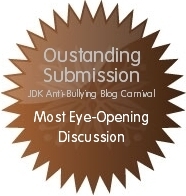 Welcome to the first-ever Anti-Bullying Blogging Carnival hosted by Colin's Traditional Taekwondo Techniques Blog. Blogging Carnivals have been popular in many blogging circles and are a great way to get blog owners working together to develop topics and draw interest to each other's blogs. 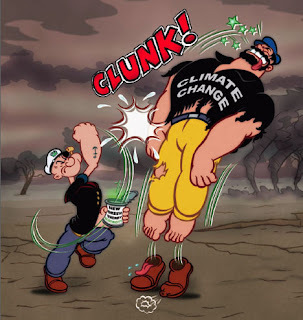 It was my hope to use this blogging carnival to create some solidarity amongst martial arts bloggers, and to help promote awareness of this important ancillary message that many martial arts instructors already do in tandem with their martial arts and self defence practices. Before I proceed, please let me thank Dr Bruce Clayton of Shotokan's Secret, Vaughan Jackson, Theodore Kruczek of Okinawan Karate-do Institute, Charlie Wildish from Bunkai Jutsu, Sanko Lewis of Soo Shim Kwan, Michele Apsokardu of Just a Thought, Lori O'Connell of Pacific Wave Jiu Jitsu, Scott Phillips from Weakness with a Twist, Neil Hall from London Chinatown TKD Wellbeing and Rick Matz of Cook Ding's Kitchen for their submissions and their support of this blogging carnival. Back in my day, bullying was considered a dreaded and unavoidable part of schoolyard antics. No one talked about it because no one knew that the situation could be improved. So I was surprised and delighted that my 10yo son could tell me that there is physical, verbal/emotional, and cyber bullying. He could also recount how his school dealt with two children who were antagonising each other: with teachers constantly supervising play times, having weekly class 'meetings,' bringing the parents into class, and ensuring that sufficient 'feel good' messages were channeled to the class in question. Just like how his school dealt with that bullying episode, I typically share with people that the martial arts also doesn't have one 'magic bullet.' There is no one secret that is kept, passed on from teacher to disciple that guarantees victory - well, not in my system anyway. And this is true for what martial artists can do to help prevent and reduce bullying - the point is that martial arts training has much to offer the child practitioner: confidence, physical defence tactics and mental tenacity - just to name the main positives. Make no mistake, martial art instructors don't just spout one liners taken from books - each instructor have had his or her fair share of dealing with confrontations, physical aggression, politics, self defence tactics and the varied aptitude of students walking through their doors. So while there may be disagreement amongst them, don't discount their experiential knowledge on this topic. These individuals live by their systems, and their knowledge has been earned not by abstract concept - but by blood, sweat and tears. It is no wonder that many commercial anti-bullying courses borrow martial arts training concepts to help participants learn certain key themes. Please go to each post and comment under their individual articles. 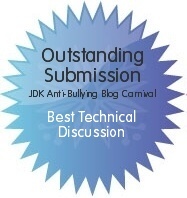 Additionally, look out for those three blog posts that have been awarded badges for Outstanding Submissions. It was not an easy task, and all who participated should know that they have done extremely well. Please congratulate all of them while you're reading their submissions. It would be great if you could promote the carnival and all of the blogs you've read here. The more traffic we get, the more we can justify increasing involvement and getting more people involved in our efforts. Push this URL http://www.joongdokwan.com/2012/04/anti-bullying-blogging-carnival.html through FaceBook or through Twitter, and get people to come support our cause. Or take the code from the widget below to display the Anti-Bully Blogging Carnival on your website or blog to show your support! And let us know about it by adding your comment below. Please subscribe using our Blogging Carnival Form if you are an owner or author of a martial arts website or blog and are interested in participating in a future carnival. Or click on the Blogging Carnivals Button below. This is great. Bullying is bad news and lifes can be ruined by it. I am proud of you for taking this great interest and passing on the message. This is such a wonderful idea! We all need to take some sort of action like this against bullying and all its sources. We all need to do something to make a difference. There is a new singer-songwriter named Becca Levy who has started a music based anti-bullying group called Right Now that you guys should check out. We really appreciate what you are doing with combining positive reflection of martial arts in the community. Please consider sharing Sensei McGraugh's instructional DVD's that provide history and sword care along with a lot more. We try to offer a respectful representation of the art of Japanese Swords.